I’ve recently bought Paul Hollywood’s Pies and Puds, it’s great and very easy to follow, last weekend I tried his Queen of Puddings it turned out really well. So, here I am again trying recipes for the Pinnacle walking breaks, last year I only had to practice for the Chamonix walking holiday, but now we have taken over Dale End Barn in the Peak District running all inclusive walking breaks I need to get moving. Thankfully I have not really got a sweet tooth but someone close to me has. Better send him out climbing big hills to burn off the calories. Butter six ramekins or individual heatproof glass dishes, 10cm in diameter. Divide the breadcrumbs between them, scattering evenly. To make your custard, put the milk in a saucepan. Split open the vanilla pod with a small, sharp knife and scrape out the seeds with the tip of the knife. Add both the seeds and the pod to the saucepan. Slowly bring the milk just to the boil, and then take off the heat. Whisk the sugar, egg and egg yolks together in a bowl. Pour on the hot milk and whisk well. Strain this into a jug through a sieve. Pour the custard into prepared dishes dividing equally,stand the dishes in a roasting tray pouring hot water halfway up the sides of the dishes. Bake in the oven for 25/30 minutes until set. 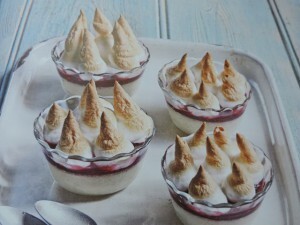 Remove from tray and cool, spread the jam over the custards and return to the roasting tin, remember remove the water. Whisk egg whites until stiff, whisk in sugar spoonful at a time until they form stiff peaks. Put meringue on top of custards bake for 10/15 minutes until golden. Serve straight away. This entry was posted in Blog, Paula's Recipes and tagged ChaletMenu, Chamonix, PeakDistrict, ShortBreak on 4th January 2019 by Pinnacle Walking-Holidays.